Articulos, ideas, informacion, imagenes desde Hacienda Tijax, Izabal, Guatemala. Articles, ideas, info, images and videos from Hacienda Tijax, Izabal, Guatemala with help from family and friends. Lots of good info on travel in the area of the Western Caribbean particularly Guatemala's Caribbean and inland waters. Everyday events, travel stories, sustainable agriculture, forestry and tourism. Rio Dulce, Livignston, Izabal. A Blog about travels though time... Visions and dreams are to reality what clouds and moisture are to rain, rivers and oceans. This vision started beyond time, perhaps it was always there, it has been blooming in this one lifetime, my life. My life and the place where Tijax is established came together through what seems a series of coincidences, some luck, being in the right place at the right time, the right friends and of course the Vision always there. José Arguelles interprets the meaning of Tijax (Etznab in Mayan) from “The Mayan Factor” a book about the Mayan Calendar as: “Hall of Mirrors, Ritual Pattern of “No-Time”, Ritual Stroke, Ritual Knife, Sword of Wisdom and Purification. North.” From conversations with Shamans I have gathered that Tijax is the symbol for the chipped obsidian or chert stone that was used in healing and bloodletting ceremonies and the sacrificial knives hence the concept of “healing pain”, “suffering”, “cutting through” as in searching for the truth and finally “transparency” and “clarity”. El día 6 de Febrero de este año se celebro en la Hacienda Tijax el "Día Internacional de los Humedales" evento organizado por el Consejo Nacional de Areas Protegidas CONAP quien es la Institución a cargo de varios Parques Nacionales entre los que se destacan el Parque Nacional Río Dulce, Parque Nac. Laguna del Tigre y muchos otros mas que cuentan con grandes Humedales. La Licda. 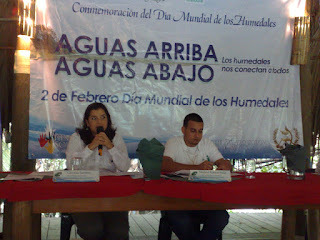 Claudia Santizo, Directora del CONAP y otros personeros de la Gobernacion deptal. del INGUAT (Melissa de Smith), el Ing. Manuel Henry Director del PNRD y el Ing. 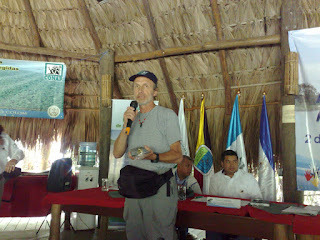 Jose Robledo Director del AMASURLI nos honraron con su presencia. Lo importante es que se haga consciencia entre el publico en general acerca de la importancia de los humedales en la ecología de nuestro planeta. Los Humedales son áreas criticas para el mantenimiento de la Biodiversidad y constituyes "gigantescos filtros" como riñones en los que se gestan miles de especies y por donde fluyen aguas que luego forman parte de nuestras propias vidas..